Recently loved Rogue's Honey Kolsch. 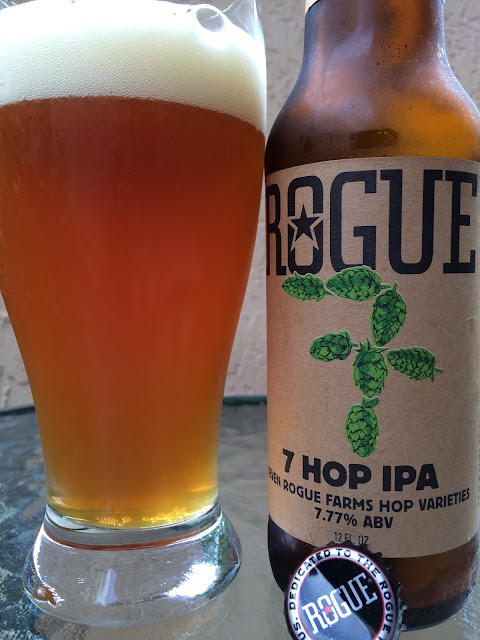 And I noticed a few other new beers from them, brewed with ingredients from Rogue Hop Farms. These new beers are similarly branded with just a simple brown paper label, small illustration and simple description. I grabbed the 7 Hop IPA. In this case the number 7 is illustrated using 7 hop cones, simple but I like it. 7.77% alcohol. Aroma pretty faint, though some orange and citrus show through. Flavors are also super subtle, though there are many delicious nuances that come together to create this beer. Sweet and tropical, citrus orange and tangerine, very juicy, even a hint of honey. Fresh, spicy, touch of pine and definitely good bitterness. Really nuanced, no dominant flavors jump out. Really nice all around. I really liked this beer.